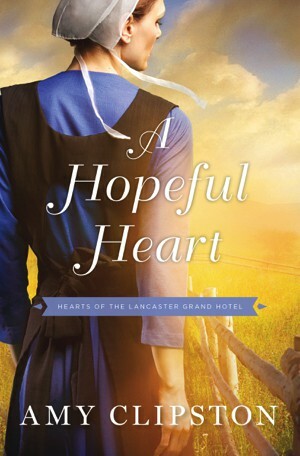 In A Hopeful Heart—the first book in a new Amish series by bestselling author Amy Clipston—Hannah Glick, a recently widowed Old Order Amish woman, struggles to support her three children after unexpectedly losing her husband. When she meets a nice Englisher (non-Amish man) at the luxury hotel where she works, her world is turned upside down while she tries to decipher God's plan for her. A Hopeful Heart was inspired during the Amish Country Holiday Book Tour in November 2011. Alicia Mey, Senior Marketing Director, suggested I create a series about Amish women who work in an upscale hotel. She was intrigued with the idea of the Amish and “English” (non-Amish) clashing in such a unique environment. I'm so thankful for Alicia's idea that I dedicated this book to her.